GitHub is hosting a new iteration of its yearly game jam again, starting on November 1 and apparently they removed the restriction of web-based games only. That means, unlike before, using Duality for your submission is fair game this time. From what I can gather on the website, it will be one month long and have a theme that will be announced when it starts, so not entirely different from our recent community jam - though the competition will likely be tougher. Ah, all these game jams and I can't join up in even one of them... I'm definitely interested, though unsure of whether I can participate. Hey, one month can definitely be used to do *something*. You mean one community project? or personal ones? Come on Duality's Discord channel. We have cookies! The theme has been announced! It's "hacking, modding, augmenting" - not entirely sure what to do with it to be honest Any ideas? not entirely sure what to do with it to be honest Any ideas? You're right. The themes are not the greatest in my opinion. It's mentioned on the theme announcement page that you don't have to strictly adhere to the theme guidelines. You can bend your way around quite a bit. You have the entire month of November to create a game loosely based on the theme hacking, modding and/or augmenting. Triple whammy: The game features your character, a virus, who has to infiltrate a secure system. Your character has to face off against security programs, who when defeated, drop different pieces of code (upgrades) which you can use to augment yourself. You can also modify your surroundings using certain abilities, once you have upgraded and unlocked them. The objective is to hack into certain points within the system and download, delete and/or corrupt different data. That sounds pretty good actually. Mind if we draw less creative souls draw some inspiration from that? 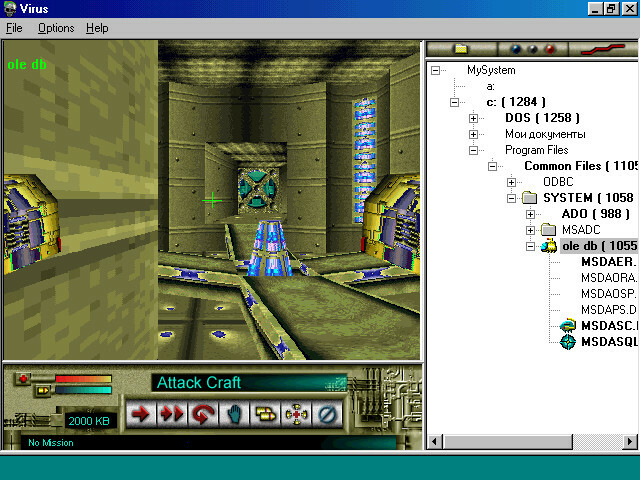 Well, there was a game in the late 90s called Virus (which I actually own), in which you played as the antivirus inside your own hard disk (the game world was basically a 3d representation of the file structure of your disk, and if you had bmps and jpgs saved around, they would appear as actual textures in game) and hunt down viruses. The game was somewhat similar to Descent in gameplay.